Eating a chewy Spree the other day, I realized that my consumption of processed candy has been revolutionized by the introduction of both sour and chewy versions of the old sweet and hard stand-bys. With Jolly Ranchers, Jawbreakers, and SweeTarts I knew exactly what I was getting into and braced my teeth for a beating; but with these candies suddenly giving way between my tensed molars, I am finding that there is nothing more satisfying than having tiny surprises frustrate and defy my expectations when I’ve already prepared myself for something entirely different. For me, music is no different -- it is essentially the hard candy of my soul, and the more it surprises me, the more eager I am to take another bite. I approached San Francisco’s emo rock outfit Birdmonster like I would a Jawbreaker. To my surprise, I discovered that the band embodies the hard-on-the-outside-but-surprisingly-soft-in-the-center aesthetic of this new “candy revolution”. On first listen, there’s no doubt that these boys rock -- hard. 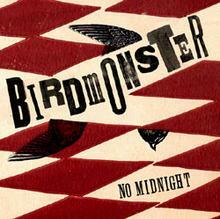 Exemplifying the energetic pandemonium of Hot Water Music, Birdmonster’s self-released album No Midnight is a cacophony of power chords, schizophrenic drums, and yelping vocals, which are reminiscent of Stephen Malkmus: sometimes off-key, often overwhelming, but always spot-on with sincerity and hyperactive tirelessness. However, it’s the softer, more dynamic moments of No Midnight, such as “Balcony” and “Ball of Yarn,” when the vocals share the spotlight with some of the more mature lyrics and instrumentation that belie Birdmonster as being purely a party favor. Instead, these instances reveal a band that knows its good at what it does, but is also self-aware enough to challenge the confines of the “emo” aesthetic and to hopefully take risks in the future to evolve into something with depth beyond a summer soundtrack.